You know what’s a huge bummer? Not having an IKEA close by. Our closest IKEA is 3.5 hours away. Terrible, right?! 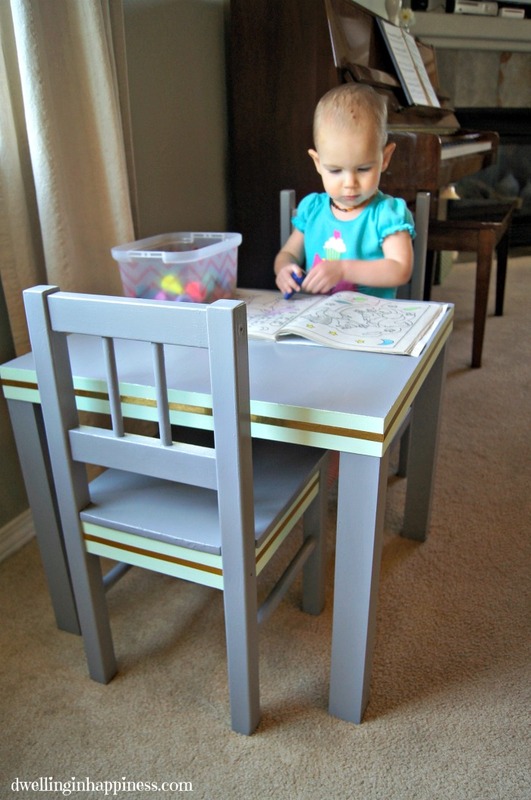 I’ve been wanting a toddler table and chair set for awhile now that Jade is finally at the age where she’s interested in coloring. I know IKEA has an adorable toddler table and chair set for pretty cheap, but we had no plans of making the trip anytime soon. Besides, getting there would be more expensive in gas than the cost of the actual table and chairs! Boo. Since poor Jade had nowhere to sit and color (and with very limited space), I scoured our house and the Goodwill for a solution. We’ve had an old black IKEA side table in our garage for awhile, and it was the perfect height for Jade. I found a couple of mismatched toddler chairs at the Goodwill which fit under the side table just perfectly. 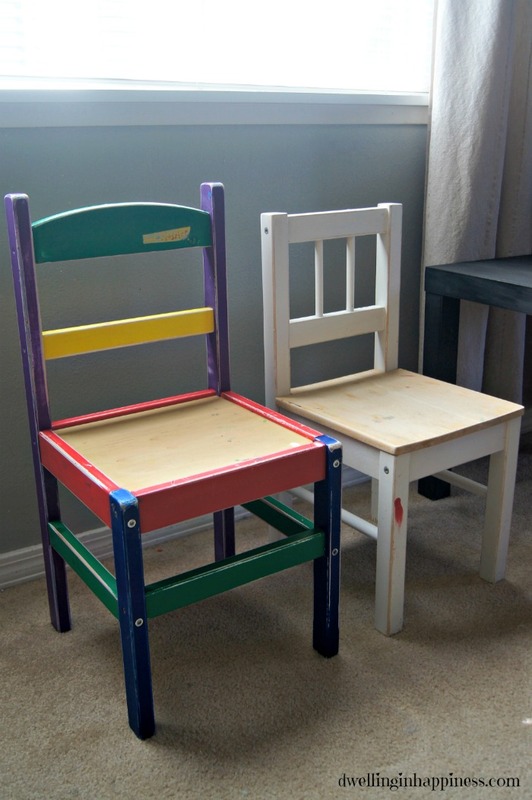 While the perfectionist inside of me was screaming to have matching chairs, my frequenting of the Goodwill and all Facebook swap-and-sell pages came up with nothing. So, for my sake (because Jade could really care less), I wanted to paint them in a way to make them look more cohesive. Ahhh, it wasn’t pretty folks. The white chair had a huge spiderman sticker on the seat and red paint splattered about, and the other chair was a mix of super bright colors. Not my style. 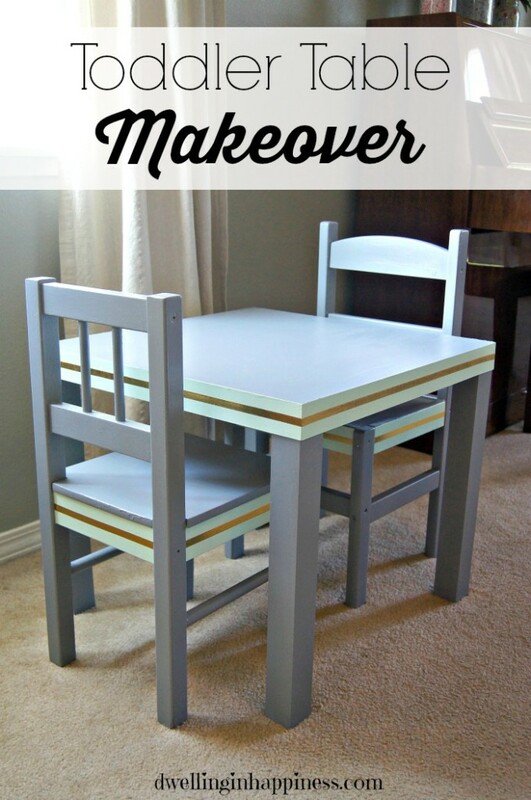 This toddler table makeover was much needed! If you follow me on Instagram, you probably saw this picture of the paint as I eagerly got started on this project over the weekend. 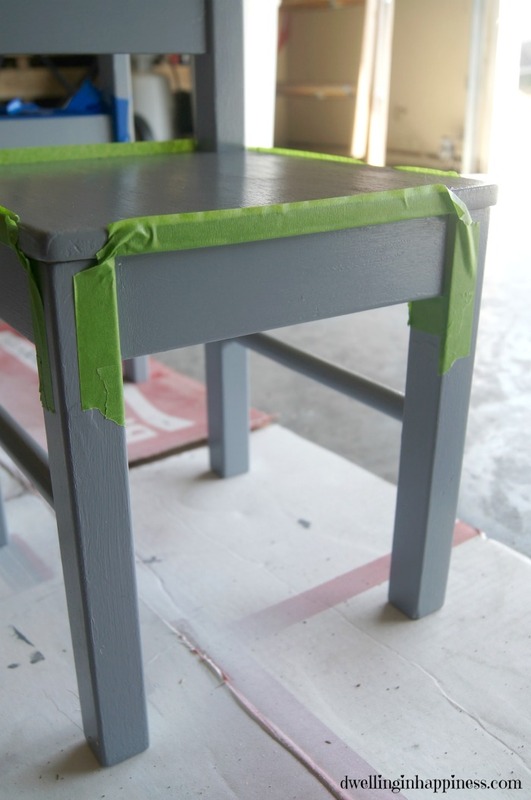 Instead of sanding the table and chairs down to bare bones (because I definitely don’t have time for that! 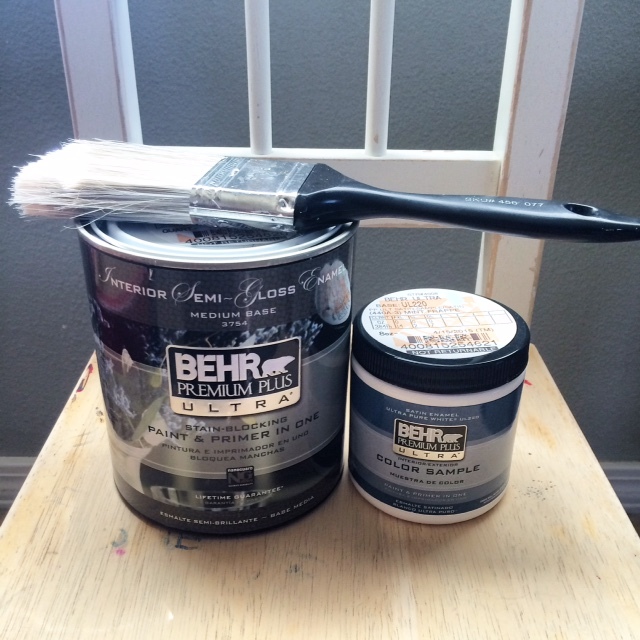 ), I bought Behr’s Paint and Primer in one. I only lightly sanded them all and wiped them down. No offense to Mr. Spiderman, but I didn’t want him showing through so I sanded it off completely. For paint colors, I chose Behr’s Dark Pewter. I wanted the table and chairs to be a neutral color that would go with our living/dining room colors since that’s the only place they’ll fit. 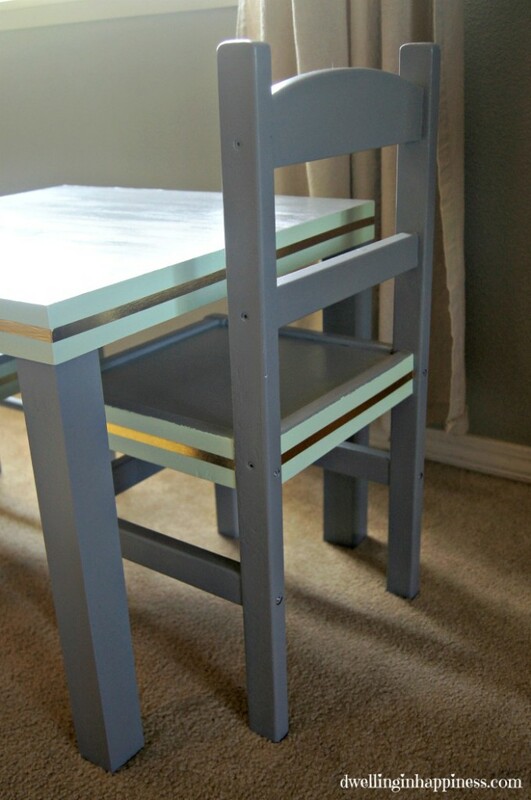 To tie the mismatched chairs and table together, I painted the edge around the table and the edges of the chair seats the same mint color I used in Jade’s room (Behr’s “Mint Frappe”). I wanted to add a “girly” element to the table, and when I read about this awesome gold foil washi tape that Bre from Brepurposed had used on a table she redid, I knew I just had to use it on this set, too! Thanks for the inspiration, Bre! I’m totally in love with how it turned out, and it’s perfect for this little space! The mint sides and gold tape really tie everything together. I’m now only slightly annoyed that the chairs don’t match. It’s a step up! While Jade didn’t even notice the makeover, it’s no longer an eye sore for me to look at. And, it got the IKEA side table out of our garage! Win-win for this momma! I made the mistake of putting the gold foil tape on while Jade was around, and now she likes to say, “sticker!” and try to peel it off. We’ll see how long it actually lasts, but at least for now it’s pretty! And, when we have another kiddo in the future and if it’s a boy, we can just peel the “sticker” off and it’ll be more boyish. My little artist! She totally loves this little “Jade-sized” table. And here’s a little before and after. These are the best! 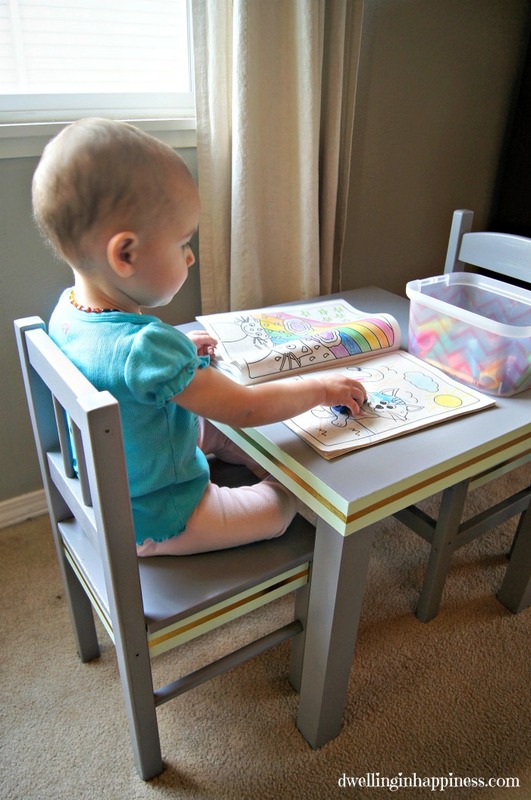 Do/did your kiddos have their own table or space for coloring? I hope you have a great Wednesday, friends! Aww it turned out so cute! That gold detail is precious. Thank you, Lauren! 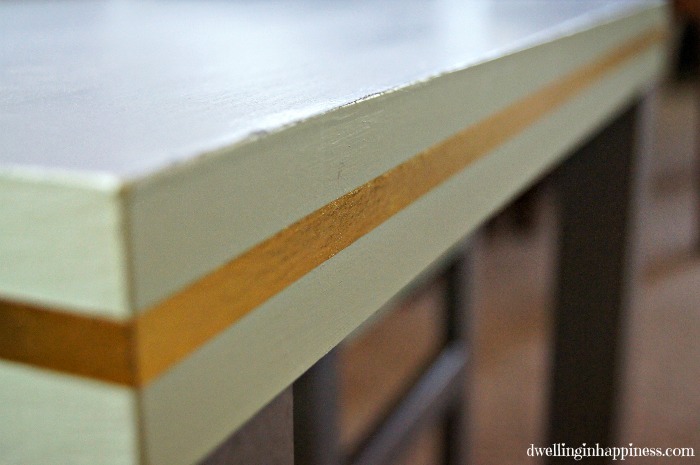 Every little girl table needs a little gold, right? 🙂 Have a great weekend! Oh my goodness! SUCH a transformation!!! I’m sure Jade loves her new table! Absolutely beautiful! What a great idea! 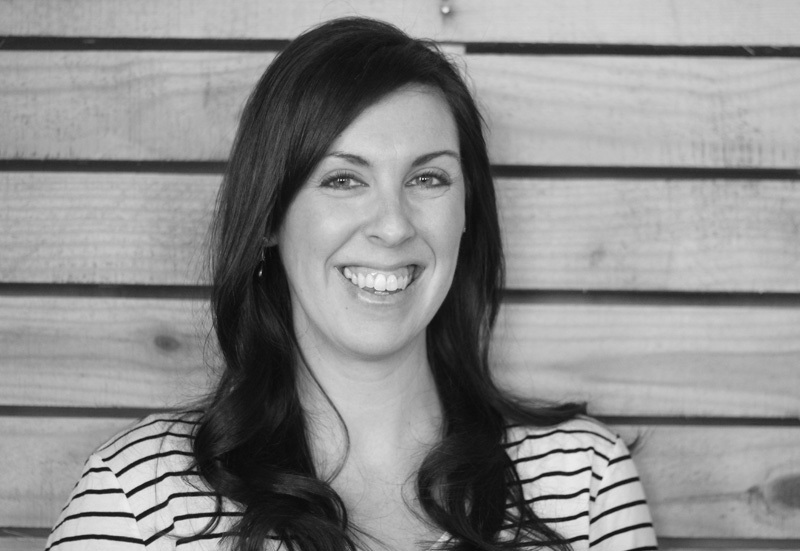 Thanks so much, Louanne! It’s definitely an upgrade from the before, right? 🙂 Have a fabulous rest of the week! Ahh this is so cute!! 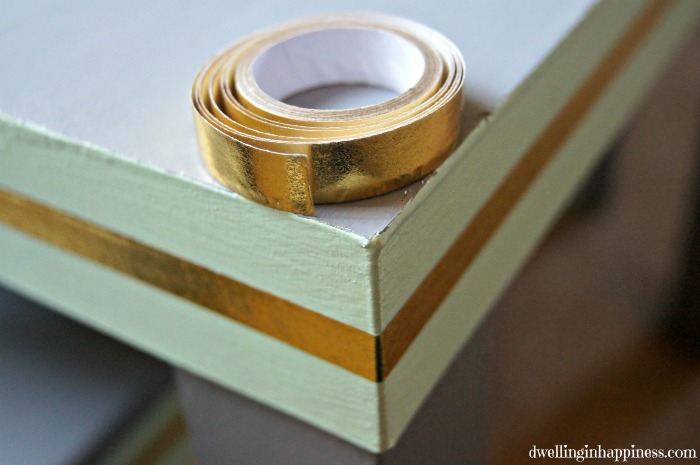 Isn’t the gold foil tape ah-mazing?! Such an upgrade from spidey! 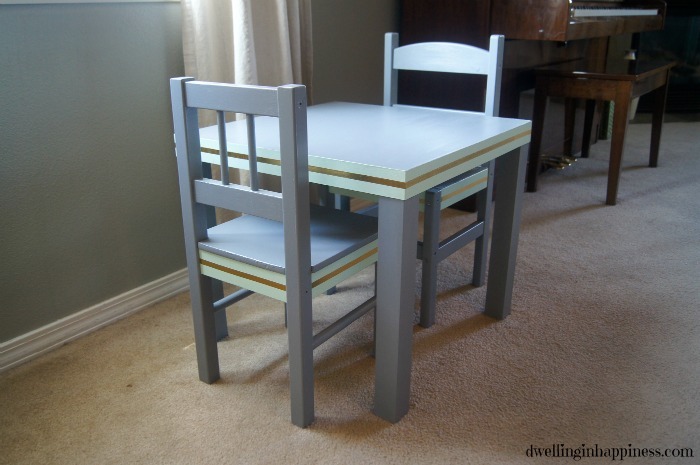 My favorite part of this table is the mismatched chairs! They go perfectly with the table… Goodwill is awesome sometimes for finds like that. Love! Thank you, Carrie! So glad you like the mismatched chairs, that makes me feel better! Ha! I wasn’t sure about them. 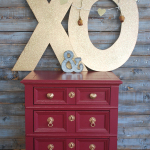 I totally love the Goodwill when I find cheap stuff like this that can be transformed! 🙂 Hope you’re week is going great! Amazing Transformation! I absolutely love it. Thank you so much, Trish! It really needed the help! 🙂 Hope you’re having a great week! Sooo cute! Just her size! 🙂 Love it, friend! Thank you Kendra! It’s perfect for her. 🙂 And it’s not so bad to look at anymore, either! Ha! wow! What a difference paint can make! 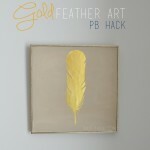 I love that gold foil tape! I seriously might have to go get some. I have got a few ideas in mind for it! so pretty! Love how to table turned out! This looks so good! I actually like the mismatched chairs. 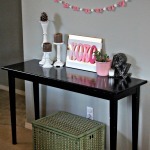 I’m totally inspired to makeover the same IKEA end-tables we have (two of them)! Thank you, Jane! That makes me happy that you like the mismatched chairs. I think I’m just crazy then, and waaaaaay too much of a perfectionist. 😉 But I gotta say, now that it’s done, they are growing on me! Ha! If you end up making yours over, send me some pictures! 🙂 Thanks for visiting! 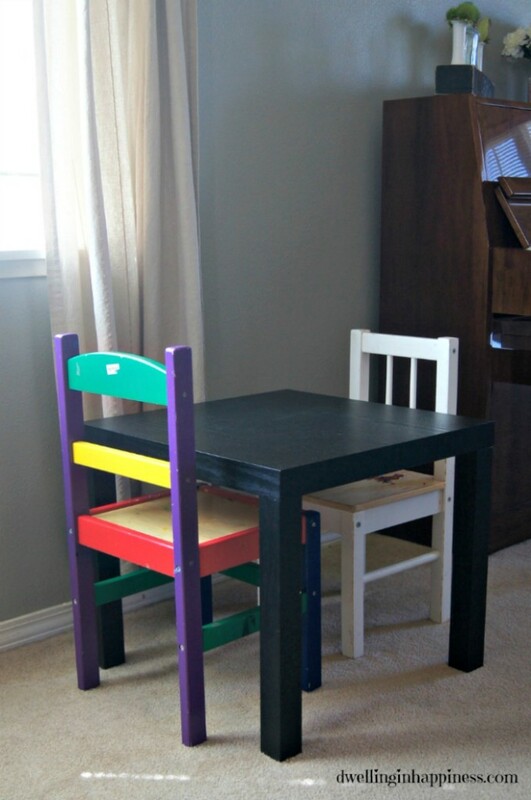 I love this new and improved toddler table! You’re so creative! 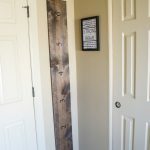 I always love your DIY projects and this is one I can try with my girls. 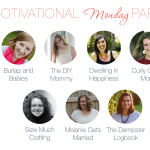 Thanks for joining the Pretty Pintastic Party, where every link gets pinned! Hope you’ll join us again this week! Thank you so much, Sarah! 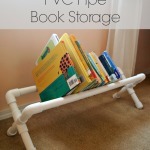 This would be perfect to get the kiddos helping with. Painting all those little places on the chairs was quite a job. 😉 Hope your week is going great! Love it! And she looks so stinking cute sitting at it!